Maribor, Slovenia – After finishing fourth in Saturday’s giant slalom, Colorado’s Mikaela Shiffrin notched her 24th World Cup slalom victory on Sunday in Maribor, Slovenia. Shiffrin charged to her 12th career top-five giant slalom result on Saturday, finishing fourth in a race won by Tessa Worley of France ahead of Italy’s Sofia Goggia in second and Swiss Lara Gut in third. 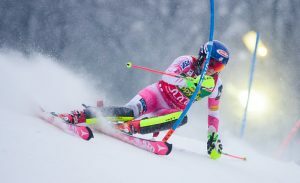 Shiffrin took a slim 0.07 first-run lead over Goggia on a straight course set. On the second run, she charged the middle section of the course – grabbing a 0.13-second lead at the second split – but wasn’t able to carry her speed through to the finish. But Sunday was even better for Shiffrin, when she won the slalom and extended her overall World Cup lead to more than 300 points. After taking a 0.17 first-run lead over Switzerland’s Wendy Holdener, Shiffrin powered through the second run to win her 27th career World Cup race. Holdener finished second as Sweden’s Frida Hansdotter was third. Like a number of skiers before her in the second run, Shiffrin battled not only a tough, grippy course, but also numerous broken gates. Midway down the course, she broke a gate that got caught up between her legs. But without missing a beat, she powered through the obstacle, carrying her speed through to victory. With the win, Shiffrin now has a 305-point lead over Gut, who did not qualify for the second run Sunday. Up next, the ladies compete in a night slalom Tuesday in Flachau.